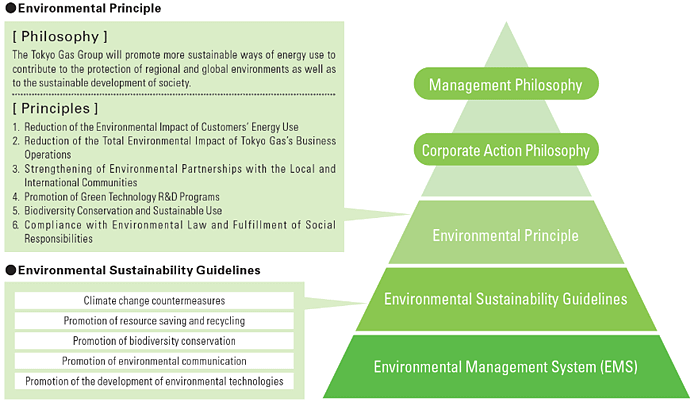 The Tokyo Gas Group pursues environmental management through a concerted effort and has established its Environmental Principle based on its Management Philosophy and Corporate Action Philosophy, and its Environmental Sustainability Guidelines to define concrete initiatives and quantitative targets. The president of Tokyo Gas releases a message every June, timed to coincide with Japan’s Environment Month, to remind all Group employees of the need to continuously address environmental issues and strive for a sustainable society as part of an enterprise that leads in environmentally friendly corporate management through the Environmental Philosophy. Tokyo Gas has supplied energy to customers since its founding in 1895. It introduced eco-friendly LNG (liquefied natural gas) to Japan for the first time in 1969 and now uses it for city gas as well as power generation. In 2005, it obtained Group-wide certification for the ISO 14001 international standard and is actively engaging in environmental protection. The company will continue to promote eco-friendly corporate management toward creating a low-carbon society and a recycling-based society and developing a society that coexists with nature. ESCO (Energy service company): service to provide a package of necessary solutions to save energy, such as technologies, equipment, human resources and funds. SRIMS: Tokyo Gas original waste collection and recycling system, which collects waste during the delivery of gas appliances and parts and piping materials to partner companies. Note: Laws’ enactment years are shown.